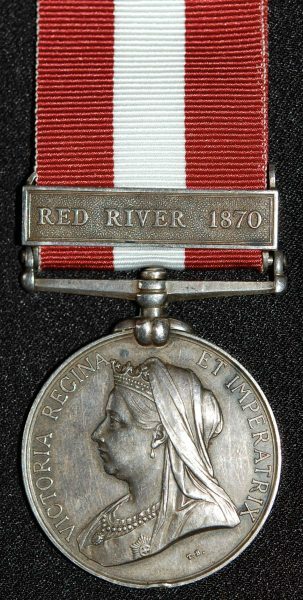 Canada General Service medal 1866-1870 clasp Red River 1870 (Ens. G. Simard, Que. R). 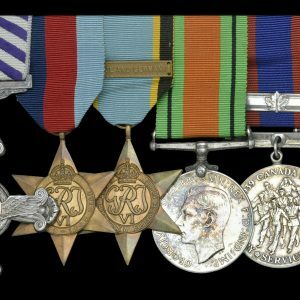 George Simard is confirmed, as an Ensign, on both the Thyen and Neale medal rolls. According to Neale and Irwin’s, “The Medal Roll of the Red River Campaign of 1870 in Canada,” there were only 502 awards of the Red River clasp. Of the 86 RR clasps awarded to this unit, only 15 were issued to Officers. 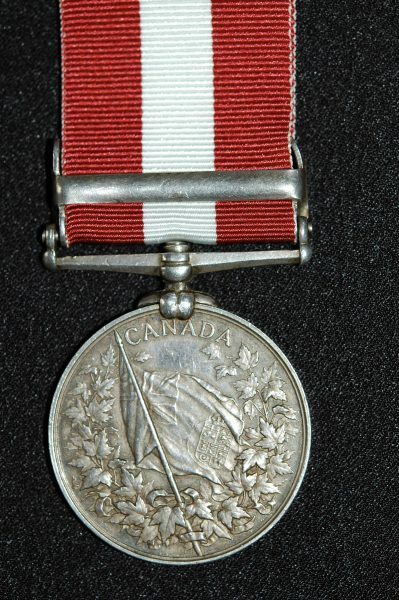 The Canada General Service medal was issued by the Canadian Government to forces who took part in the operations to put down the Fenian Raids. 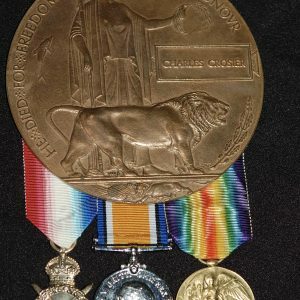 It was issued some thirty years after the event so a large number of soldiers did not receive their medals. In 1837, Louis J. Papineau and William MacKenzie, led the first rebellion intending to end Canada’s connection with Britain. In the 1860’s an Irish National Militia vowed its intentions to liberate Ireland from the “yoke of England” for the purposes of establishing an Irish Republic. The same group in the United States declared its intentions to invade Canada and on the 31st of October 1866, under Colonel John O’Neill, a small group defeated Canadian troops at the Battle of Ridgeway on the Niagara River. A counter-defense was put together and a large number of Canadian volunteers came forward. Fearing the strength of the Canadian soldiers, many Fenians deserted and on the 3rd of June 1866 the remainder surrendered to the American Warship Michigan. Things remained quiet until 1870 when O’Neill once again crossed the border at Vermont into Canada where he was captured. When returned to the US he was arrested by authorities there. O’Neill mounted a third invasion, this time in Manitoba which amounted to the famous Red River Expedition. The Red River Expedition, under Colonel Garnet Joseph Wolseley, was to quell the rebellion led by Louis Riel and it headed to Fort Garry on 14th May, 1870. British subjects had been imprisoned, murdered or maltreated. 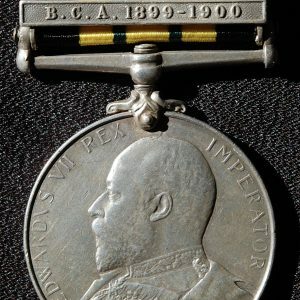 Although Wolseley succeeded in quelling the rebellion, Riel managed to escape going on to lead the Second Riel Rebellion in 1885, for which the North West Canada medal was awarded. Rim bruise, otherwise nicely toned and near EF. A very rare issue to an Officer of the Red River Expedition. 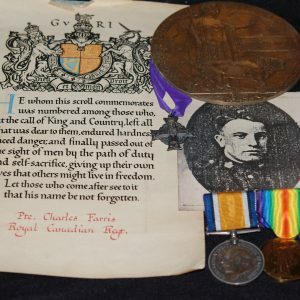 A Great War pair, Memorial Plaque and Memorial Cross Charles Farris (106th Btln and RCR)!